I am so thrilled to debut my newest preschool program called “Grandparents In the Bible.” Over the years, I have been asked to share my musical Bible programs at “Grandparents’ Day Events.” I thought it would be great fun to actually create a program centered around grandmas and grandpas to help celebrate and honor their lives, but with a biblical focus. 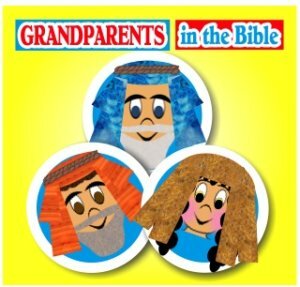 With great visuals and a catchy song, the kids have fun learning about these great grandmas and grandpas of the Bible. If you are familiar with my programs, you know that “Scripture Granny” often makes a visit to the children via a computer “phone” call. Since the program is about grandparents, an appearance by Scripture Granny was a must! During this visit, Scripture Granny teaches the children about what it was like in the “old days.” For example, when Scripture Granny was young, she typed on a typewriter to write a letter. Today, she sends an email on the computer. Scripture Granny teaches how what is old can become new. This is especially true when we give our lives to Jesus. God makes us a new creation according to 2 Corinthians 5:17. Scripture Granny teaches the children this Bible verse through a fun energetic song. In this part of the program, the preschoolers get to play a game to help them learn about how things from the “old days” have changed over the years. using fun visuals and a fun poem, the kids get to match the old with the new, which teaches them that almost everything changes. One of my newest additions to my programs, are my fun and sweet puppets named Jack and Jill. Jack and Jill teach the children that their own grandma is awesome. She used to fly airplanes in the Army and can even ride a skateboard! Jack and Jill then share how their grandma loves to teach them about Jesus and they proceed to sing their version of the “Jesus Love Me” song. If you haven’t seen the Bible Story Sticks in action yet, I highly encourage you to click HERE to learn more about this GREAT tool to share any Bible story. I knew that I wanted to use my Bible Story Sticks to share the story of Lois and Eunice from the Bible. Lois was Timothy’s grandmother and Eunice was Timothy’s mother. Together, God used these two faithful women to lead Timothy to Jesus. God used Timothy in mighty ways to help the apostle Paul in his ministry. If you know me, you know that every one of my programs includes a “magical” Bible object lesson to delight children in the truths of God. “Grandma’s Cookie Jar” teaches the children that God always wants us to do the right thing. The kids LOVE Scruffy! Darcie Maze’s Puppet, Scruffy, is always a hit! In my “Grandparents in the Bible” program, Scruffy receives a gift in the mail from Scripture Granny. While she was on a missionary trip to Mexico, Scripture Granny took the time to buy a maraca for Scruffy to play with. This makes Scruffy very happy. In fact, his heart grows 10 sizes bigger because of Scripture Granny’s love for him. 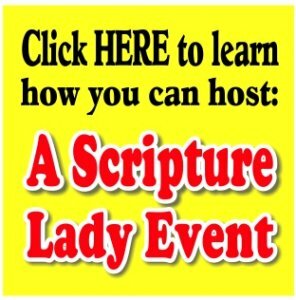 Looking for other programs offered by The Scripture Lady? Then click HERE to be taken to a list of programs. If you liked this outline of my program “Grandparents in the Bible,” then sign up to receive Scripture Lady’s Free Email Kid Tips packed full with creative ideas and receive 12 FREE Bible downloadable resources to help get the kids you minister to excited about the Bible! Just go to www.MyFreeBibleGames.com to fully subscribe.